Often times I am asked to explain what Mock Trial is. I am always at a loss. If I had to try, I would say that it is a 2-hour improvisational session that requires intense study of a 100-page document. It has statements and legal papers that accompany a real legal case and uses many of the legal rules and regulations required in a courtroom. The twist to the improv is that it is with another school and, although there are parameters to the content, the arguments and points that are presented are completely new to each team. When I explain it that way, I usually see horrified looks on people’s faces...as though they just swallowed a fly. “Who would ever want to be a part of that?” their face seems to cry out. In truth, the kind of student who is on Mock Trial is a sort of gladiator. They walk into the coliseum of a courtroom armed with their weapons of preparation and confidence. As each section of the trial unfolds, we watch our teammates: There’s the opener, who has to prepare a 5-minute opening statement that outlines the case and the legal ramifications along with how the case will play out. Then each lawyer (3 of them) directly examines their witnesses and cross-examines the opposing side witnesses. They are trying to build up their side while destroying the opposing witness’ credibility and trust. The lawyers also have to be ready to object to legal violations and respond when they are objected upon. Each of our witnesses memorize the information on a three-page affidavit and answers the direct and cross questions accordingly. They must be careful not to fall into the opposing teams’ traps and turn the questioning from a negative to a positive for our case. Finally, the closing lawyer creates the closing argument, a 7 minute presentation, while the case is playing out. It sums up all of the arguments of both sides, their strengths and weaknesses, and shows with utmost finality that our side should prevail. Each trial lasts from 2-2.5 hours and the students are judged by area lawyers and judges at the Ramsey County Courthouse. Each section and student is graded individually out of a 10-point scale. The points are added up and the winning team advances. Mock Trial - A Tremendous Challenge. A Huge Reward. The skills needed for mock trial are rhetoric in nature. The students must convince and persuade the jury and the judges that their case should win. They must find arguments and areas of weaknesses within the witnesses’ affidavits and must exploit those weaknesses to their advantage. They must do all of this while being verbally challenged by bright, quick, and witty students from the opposing team/school. This is the ultimate game of wits, persuasion and confidence - one that Liberty prepares our students exceptionally well! 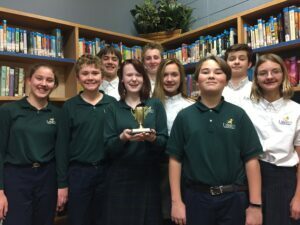 The 2018-2019 Mock Trial team consisted of nine 7th-10th graders who competed against mostly all high school teams. Our team ranked 7th in our region (which consisted of 36 high school teams). We also came in third place at the Golden Gavel Mock Trial Tournament at the University of Minnesota, which had 23 teams. We went into Super Regionals undefeated and had the strongest trial of the year there. In the end we lost to the team ranked 7th in the state of Minnesota. What an amazing season! 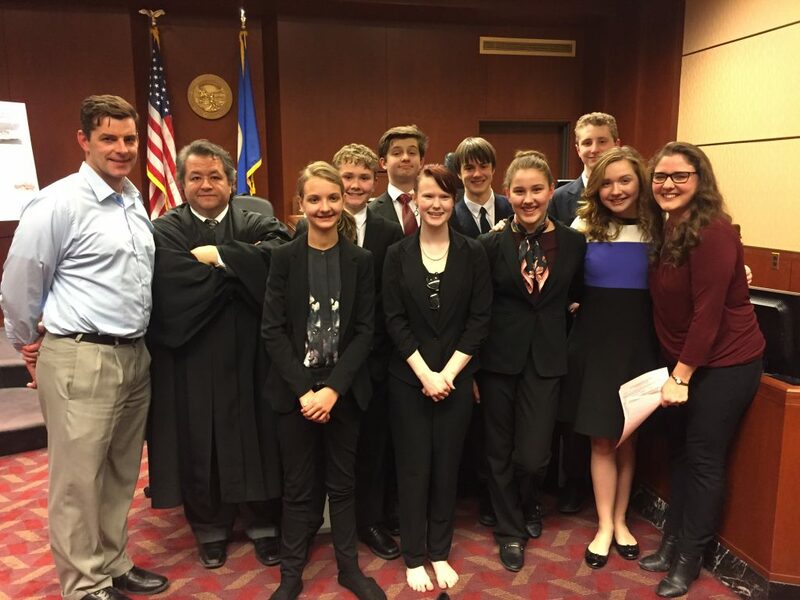 This is the 2nd official year that Liberty Classical Academy has had a Mock Trial team. As the teacher and coach, I work with Dan Gallatin (who was our lawyer coach) along with various other parents from Liberty who invest in the team. Our hardworking team practiced 2-5 days a week in preparation for our tournaments and trials from October through February. We are inviting the 6th grade students to participate in this next trial during the 2019 Spring season to prepare them for the official season next Fall. The team is brilliant and full of different gifts that are needed to make a team strong. There is a spot for everyone on a mock trial team, even those who fear public speaking. It is a game like no other, challenging the skills and abilities that can only be honed in the heat of the trial: overcoming fears, challenging peers, and giving a feeling of victory unlike any other!